Imagine that during our evolutionary history, we could not turn our heads up or down. How might our vision have evolved differently from the two frontal, mobile eyes we have today? Zebrafish larvae, a fan favourite when it comes to scientific research, can help us with this thought experiment. They have visual systems completely unlike our own. “Here we show that larval zebrafish use a highly anisotropic retina to asymmetrically survey their natural visual world,” the authors write in the paper published in Current Biology. Basically, in their 360-degree, four-colour vision, up and down look very different. But how? The researchers visited 31 shallow zebrafish habitats at six locations off the coast of West Bengal, India, taking photos to determine what kinds of things the large larval eyes typically see. 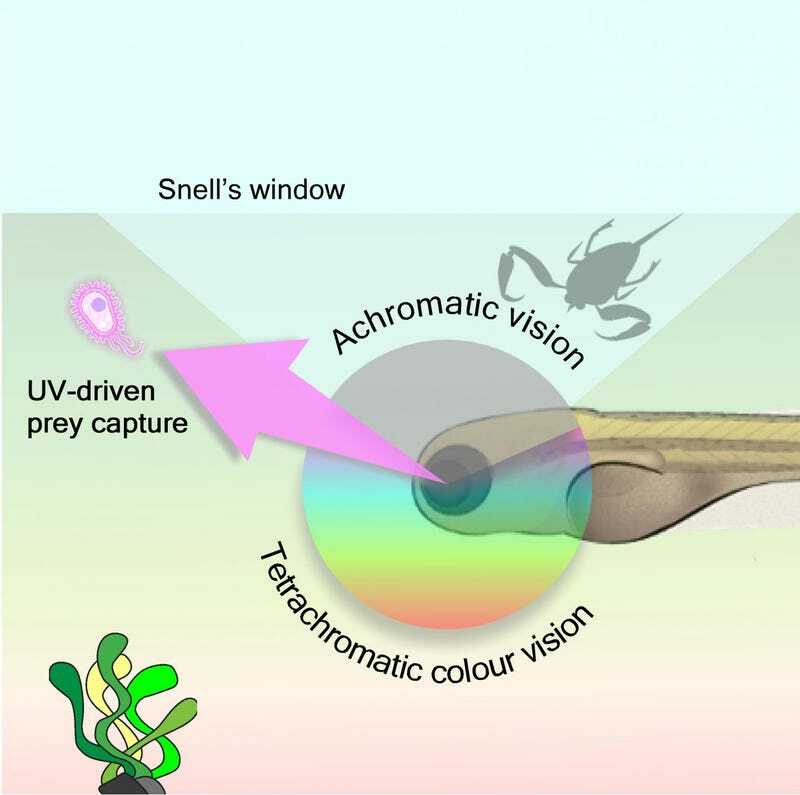 That led to three hypotheses based on the data: that the upper half of the fish eye would see less colour; that the fish would be able to see their prey in ultraviolet; and that the fish would see in four colours (the three colours we see, plus ultraviolet) straight ahead and below. Then came the lab testing—the researchers bred genetically modified fish, so that proteins in their eyes’ light receptors would glow in response to the corresponding colour of light they observe. Then, the team immobilised the fish and injected a chemical that prevented their eyes from moving, and shined various colours of light at the fish eyes, measuring how the light receptors reacted. It seemed that the experimenters’ hypotheses were right. “We have shown that inner-retinal circuits of larval zebrafish are exquisitely matched to their natural visual environment on several levels,” they wrote. The parts of the fish eye that view things at the level of or below the fish mainly see in three colours and in ultraviolet, while the parts of the eye that view things directly above the fish see mainly in black and white and ultraviolet light. 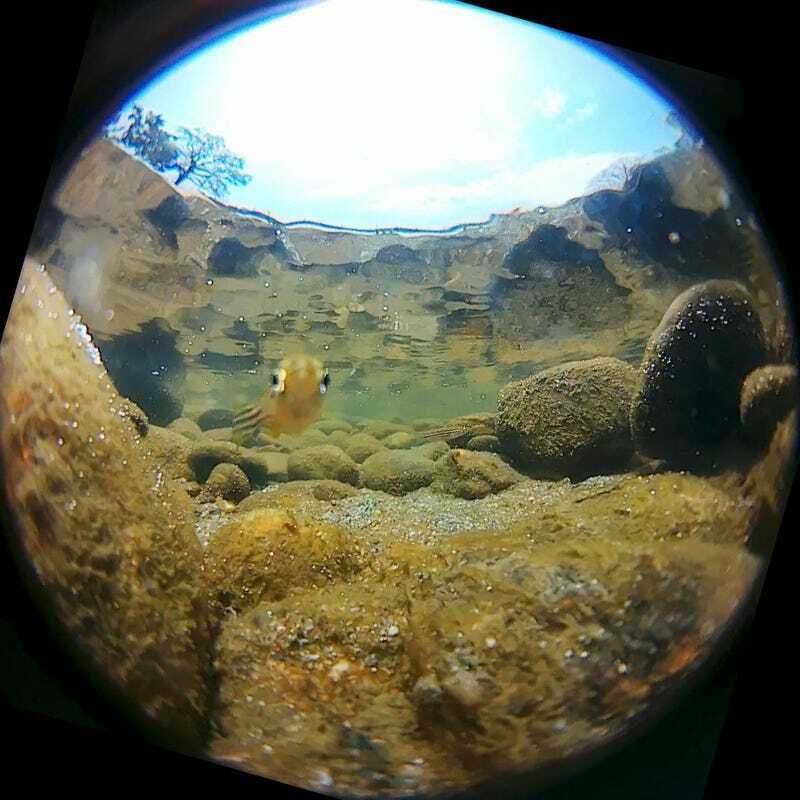 The researchers note that there is more work to do, like understanding how the baby fish actually use this information and whether adults, who have more varied behaviour, have a similar field of view. Also, they point out in the paper that they couldn’t directly measure green photoreceptors, and had to do some maths based on subtracting out other colours’ responses.